China’s national railway is expected to carry 15,200,000 passengers over the October Mid-Autumn Holiday. On October 6, the national railway transported 13.795 million passengers, an increase of 1.427 million (+11.5%) compared with the same period last year. 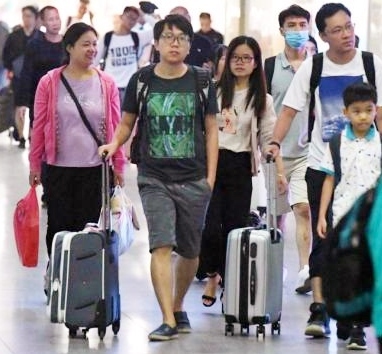 The Beijing Bureau Group carried 1.24 million passengers, an increase of 11.7%; the Shanghai Bureau Group carried 2.517 million passengers, an increase of 8.9%; the Guangzhou Bureau Group carried 19.13 million passengers, an increase of 15.9%. In order to cope with the peak passenger flow, the railway department optimizes the transportation organization, implements the convenience and benefit service measures and smooths passenger travel and strives to create a beautiful travel environment for passengers. The Harbin Bureau Group opened railway trackless stations in 57 cities and towns where the train is not in the pipeline. The Shenyang Bureau Group arranged volunteer services at stations in Shenyang, Shenyang North, Changchun, Dalian and introduced mobile phone APP tickets to passengers at the ticketing hall to help passengers use self-service ticket machines to purchase tickets. In order to cope with the peak passenger flow, the Beijing Bureau Group strengthened communication with relevant government departments, optimized the passenger connection schemes of Beijing Railway Station, Beijing West Railway Station and Beijing South Railway Station and added staff to transfer to the subway and public transportation. The Hohhot Bureau Group opened a green channel for group passengers at Hohhot and Baotou stations and opened a maternity and child waiting room, emergency medical service points and key passenger service posts to provide caring services for passengers. The Wuhan Bureau Group coordinated the arrival of a large number of passengers at night to the three major stations in Wuchang, Hankou and Wuhan, coordinated the local traffic connections, and opened the “Great Station Express” subway passengers after the normal operation of the subway. Xi’an Bureau has independently developed the “Postcode Scanning Voice Broadcasting” equipment. Passengers only need to place the ticket on the reading device and then generate the specific azimuth and dynamic guidance route of the passenger on the screen. Voice broadcasts to enhance the travel experience of passengers. The Jinan Bureau Liaocheng Station will move the ticket vending machine to the waiting room to facilitate the passengers who carry the children to reissue the tickets. The Shanghai South Railway Station of the Shanghai Bureau Group implemented an intelligent navigation system to enhance passengers’ in-vehicle, inbound and outbound, dining and other all-round intelligent navigation experiences. Nanchang Bureau Group in the Pingxiang, Yingtan, Shangrao, Ruijin, Wuyishan, Xiamen, Longyan and other tourist destination stations, close contact with the city’s public transport, rental and other public transport departments, according to passenger flow big data analysis, in the arrival, departure concentration period, encryption The scenic spots and stations are connected to the departures of the vehicles, and the passenger flow is promptly and orderly. Nanning Bureau Group has added 20 new energy electric minibuses and 70 chartered vehicles in the high-speed railway trackless stations such as Baise and Yulin in Guangxi. After arriving at the station, the majority of passengers can directly transfer through to facilitate passengers’ travel. During the holiday season, passenger travel is more concentrated. Passengers who have successfully booked through the Internet or telephone but have not yet received the ticket should pick up the ticket in advance and bring the ticket and valid ID card with the ticket when you ride. Allow sufficient time to collect tickets, security checks, ticket checks, transfer, so as not to delay the trip.